It is important to know that CAKE doesn’t handle any invoicing of Advertisers or paying of Affiliates. The Accounting section is strictly designed for you to work with your own Accounting tool or software. Once you open your Accounting tab, you can see on the left that you have the option of viewing your Affiliate Accounting section, or Advertisers/Buyers. Once you choose Affiliates or Advertisers/Buyers, you will see that no bills have been generated. CAKE will never automatically generate your bills for you, and the purpose of that is for handling returns and adjustments. If there are any returns and adjustments to be made at the end of a billing cycle, you'll want to make those adjustments before generating the bills. Click the hyperlink for "Generate Them" or the button for "Generate Missing Bills"
Account Status: This will show you if the Affiliate is Active or Inactive. Green means Active, red means Inactive. W8/W9: This will let you know if you've uploaded a W8/W9 to the Affiliates card. Uploading this document takes place on the Documents tab on the Affiliate Card. Green means Yes, red means No. Start Date/End Date: These dates will show you the timeframe of the bills you generated. This is based on the Billing Cycle and Billing Period that you chose before generating the bills. Bill Amount: This field will show you how much you owe the Affiliate. If you click on the hyperlinked amount, a window will open up and show you the line items of exactly what you owe the Affiliate for. Adjust: This section will allow you to adjust the total bill amount. Clicking the hyperlink will open a window where you can make your adjustment. Simply type in the amount you would like to add to the bill, or the amount you would like to remove. Received Invoice: By clicking this hyperlink, you'll be able to add information about the invoice you received from your Affiliate, as well as the date it was received. Sent Payment: By clicking this hyperlink, you'll be able to add information about sending the payment to your Affiliate, as well as the date it was sent. Payment Type: This column will pull the info that was added under the More tab on the Affiliate card. Payment Type, and Payment Type Information. Previous Unpaid Bills: This column will show you if there are any bills from previous billing cycles that you still owe this Affiliate for. Green means yes, and Red means no. If you do have previously unpaid bills for your Affiliates, you can view them by clicking the left subtab for "Unpaid Bills". QuickBooks: If you are using Quickbooks Online, you have the ability to import Affiliate information into your Quickbooks Online account. Please speak with your Account Manager about this integration. Minus Button: This will remove the line item from your Accounting section. Bills should only be removed if changes need to be made in reports before paying your Affiliate. Prepaid: This column will show you if the Advertiser/Buyer has prepaid you. Green means yes and red means no. Bill Amount: This field will show you how much the Advertiser/Buyer owes you. If you click on the hyperlinked amount, a window will open up and show you the line items of exactly what they owe you for. Sent Invoice: By clicking this hyperlink, you'll be able to add information about the invoice you sent to your Advertiser/Buyer, as well as the date it was sent. Received Payment: By clicking this hyperlink, you'll be able to add information about receiving the payment from your Advertiser/Buyer, as well as the date it was received. Previous Unpaid Bills: This column will show you if there are any bills from previous billing cycles that you still owe this Affiliate for. Green means yes, and Red means no. Minus Button: This will remove the line item from your Accounting section. Bills should only be removed if changes need to be made in reports before handling payments. If you click on the hyperlinked Bill Amount, a Bill detail card will open up and show you the specific line items for that bill. From here, you have the ability to adjust specific bills on a per Campaign/Offer basis, and have the ability to export the line items. Clicking the hyperlink for Received Invoice or Sent Invoice, as well as Sent Payment or Received Payment, will open up a wizard that allows you to put in specific details about the Invoice. Once complete, the hyperlink will change to show the date the invoice was sent/received. You do have the ability to mark Invoices as sent/received in bulk, as well as marking payments as sent/received in bulk. To do this, check the box to the left of all the line items you'd like to update. 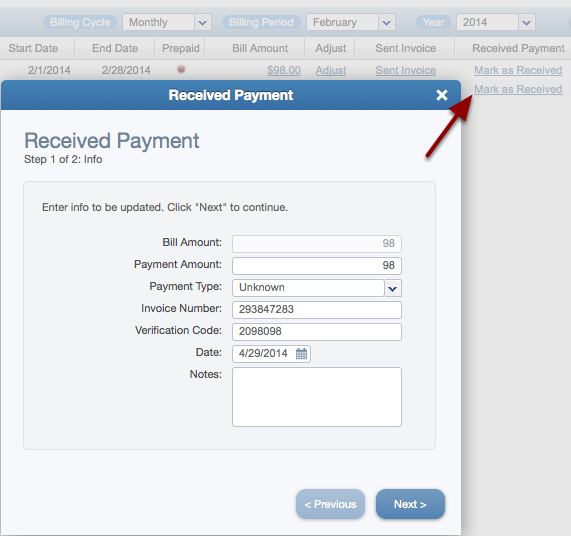 At the top, you will see a button for Received Invoice, as well as a button for Mark as Paid. Clicking one of those buttons will change the hyperlink to include the new date sent/received. The Unpaid Bills section lists all Bills not Marked As Paid. From this section you can update one or more bills to update their status. You can also Export by using the export button. Once you have had additional currencies enabled in your instance, these will need to be updated on a regular intervals to adjust for the exchange rates at the time of processing billing. If you do not enter an exchange rate for a period CAKE will default to a 1:1 exchange rate across all currencies during that period. It is possible to correct this afterwards but aside from the confusion caused any bills generated including values during these exchange rates will need to be deleted and regenerated. Please see our Exchange Rates document for more information. There are several ways to extract data from the accounting section to enter into your accounting software or tool. Compare the QuickBooks export with a CAKE billing export, and notate the fields that need to be mapped to CAKE fields. ****NOTE: Unfortunately QB Online can only accommodate 1 AR and 1 AP entity so we have mapped Buyers and Affiliates and Advertisers cannot be mapped at this time. Once connected, a new button will appear in Accounting to pay Affiliates and the ‘Sent Payment’ field also reflects a new option to pay individual bills through Tipalti provided the billing setting is set to Tipalti.